Four standard sizes are available for your rectangular table: length of 47, 78, 98 or 118 inches. It depends on your needs, but you can cheat on the drop of the tablecloth. In general, it is expected between 8 and 14 inches from the table top. You can play on a small margin to cover a table that has a specific dimension. The width, meanwhile, exceeds the standard (59 inches), of 2 inches, which is significant. 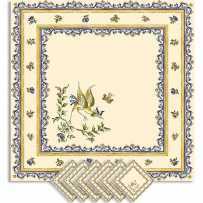 The motifs of this print are the faithful replica of the traditional decorations on the Moustiers faience. The bird with blue and gold wings, and its small satellite butterfly, is very characteristic of this French village where numerous earthenware craftsmen gather. It is very popular with connoisseurs, and continues from generation to generation. In linear shape, it is here figured in large bands where we see birds scroll in different positions, placed on a flowering branch. 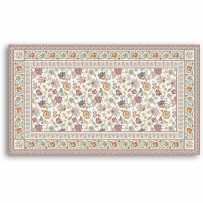 Each band is lined with a fine frieze, then a bottom punctuated with florets, then a wider floral frieze. All the drawings are delicate and poetic. The colors look old, almost weathered by time. They are present as parsimonious touch on the dominant ecru that gives them meaning. In blue as in pink, the Moustiers print is exquisitely sweet! 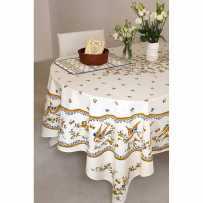 If you are planning a wedding reception and you do not want white fabric, the beautiful tablecloth Moustiers is for you. It will replace a formal white dressage with no doubt. It is so refined that you can simply use simple white plates. The print will make the decor. 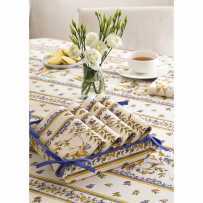 A rectangular tablecloth may cover an oval table very well, and vice versa. 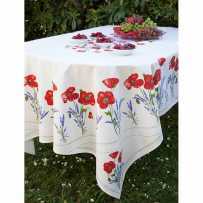 This is especially true when the pattern of the tablecloth is placed such as in the Moustiers oval tablecloth.